The return to the tournament tips off on Thursday night. 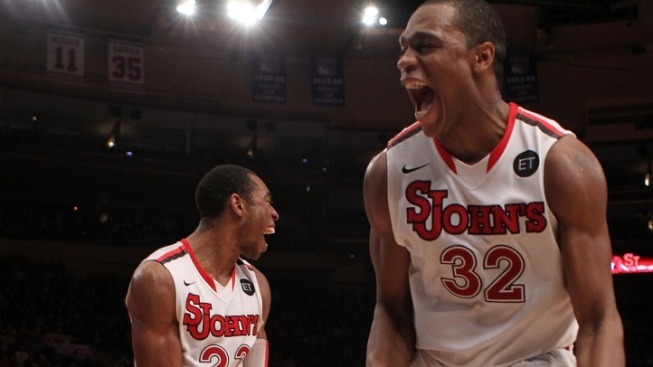 How long has it been since St. John's played in the NCAA Tournament? Mark Zuckerberg had started neither Harvard nor Facebook, Justin Bieber was only popular around the jungle gym and Barry Bonds was still fairly well liked when the Johnnies went down against Wisconsin in a first round game in 2002. Since then, the basketball program has churned through coaches, scandals and losses at a furious rate while rarely registering on the national radar screen. Perhaps that's why you find yourself lacking in knowledge about the team hours before they make their return to the tournament floor. They face Gonzaga in Denver on Thursday night so there's still plenty of time to get your facts straight and sound like a seasoned Red Storm fan while watching the game. And if you don't get it all down, don't worry. A full day of St. Patrick's revelry will mean no one will be able to remember in the morning anyway. How'd they get here? - Steve Lavin took over the program last spring after Norm Roberts ended another mediocre season with a loss in the NIT. Lavin, who coached UCLA before working for ESPN, immediately started landing big name recruits, but predictions of success on the court were few and far between. Lavin's rep wasn't that of a big-time game coach (which makes his decision to hire former Purdue coach Gene Keady as an assistant a real score), but the Red Storm defied expectations by finishing near the top of the nation's top conference. Along the way they knocked off Duke, Notre Dame, Pitt and UConn to become known as giant killers. Who are the players to watch? - Dwight Hardy was a playground phenom in the city who went to junior college in Iowa before spending last season on the bench in Queens. Lavin made him a starter and the decision paid off marvelously. The point guard turned out to be one of the best players in the country with a flair for the dramatic that makes you wonder what he might have on tap for his tournament debut against a team ill-suited to stop him. Unfortunately, the bigger story for St. John's might be who isn't playing Thursday. Why are they doing it for D.J.? - D.J. Kennedy was the team's leading rebounder this season and the kind of guy who earns all kinds of praise for his intangibles from broadcasters. He blew out his ACL in the Big East tournament and won't be able to play again this year. The Red Storm missed him terribly against Syracuse and they will likely miss him again Thursday against a Gonzaga team that is blessed with a lot more size on the inside. Justin Brownlee and Sean Evans are both fine players, but no Kennedy will make life much easier for the Zags. What else do we need to know for Thursday? - The most interesting thing about the game is the way that both sides can tout experience as a strong suit. The Johnnies bring a senior-laden roster that knows this is their only shot at tournament glory against a youngish Gonzaga team that isn't as good as some other recent entries from Spokane. Young as they are, though, the Zags are in the tournament every year and their players are used to life on this stage. Another big thing to watch will be the tempo and style of the game. Gonzaga will want to run more than the Johnnies, but St. John's could have a hard time controlling the tempo without some help from the refs. Big East basketball has a different physicality than what they play everywhere else and a lot of whistles would make it very hard for them to play their game for the full 40 minutes.